If you haven’t heard about ‘cake smash’ already, it’s time you did. 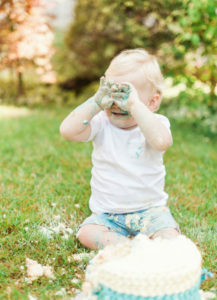 The U.S. cake smash craze has reached Blighty’s shores and UK parents are embracing the latest kids’ birthday trend, which offers a fun twist on the birthday cake tradition. Cake smash is also the latest birthday activity to provide a perfect photo opportunity for little ones. Get prepared for some sticky cake fun. So what exactly is this new craze? The cake smash involves, erm a cake (covered in yummy butter icing) and said birthday boy or girl’s dexterous little cake-smashing hands! 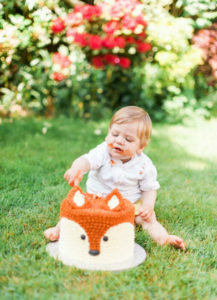 It’s essentially a chance for your one-year old to adorably destroy a cake with their adorably chubby bare hands. And cake-smash photos are the new must-have special pics for the family album. It’s a far cry from the professional studio shot and much more fun is to be had in the process. Most toddlers love their smashing adventure, and some even plant their faces in the gooey delight. This eccentric approach to the first birthday cake isn’t perhaps the best idea for parents’ who fuss about making a mess. But at Cakes by Robin we think it’s a fabulous idea. Any tradition involving cake gets the thumbs up from us, and we love the whacky cake smash ritual. In fact, we’d go as far to say there’s no reason why adults can’t have a cake smash ritual too. Come on, admit it – you’d secretly love to have a go, wouldn’t you? 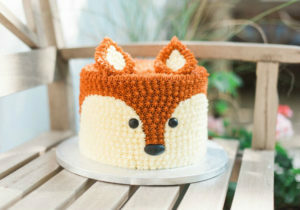 We can make a cake with your child’s favourite animal as part of the design (don’t you just love our fox cake we made especially for a little fellow called Fox) or a simple iced cake with beautiful colours. Perhaps a giant cupcake will delight? We know exactly how squidgy to make the icing so your toddler gets to make maximum mess! 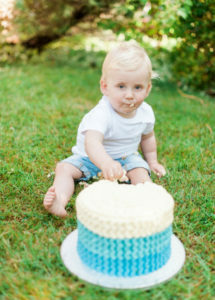 Watch your little one’s eyes light up when they get to have fun and taste our delicious cake. On a practical note, if your child’s party is indoors we suggest you sit your little smasher on a piece of oilcloth, or if you’ve made it into the garden, use a wipe clean picnic mat to make the clear up easy. Round your child’s party off with a very bubbly, bubble bath for the post-smash clean up! 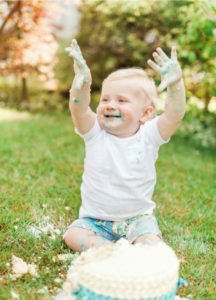 If your beautiful babe loves making a beautiful mess, then a cake smash party will make a terrific birthday treat.